We serve these beets on a bed of garlic-honey yogurt, but they are also fabulous on their own, tossed with pasta, or made into a bruschetta on wood-grilled bread spread with ricotta. If your beets come with their tops, roughly chop the greens and stir them in at the end of cooking. In a small bowl, stir together the yogurt, honey, and garlic. Set aside. In a large skillet, combine vegetables, oil, honey, a pinch of salt, and 1 cup water. Bring to a simmer, cover and cook until beets are tender. This will take about 15–20 minutes, depending on the age and size of the beets. When the beets are tender (they can be easily pierced with a fork, but shouldn’t be falling apart) remove the cover and add the orange juice and zest. Raise the heat to medium-high and cook until the beets are just starting to brown and are shiny and glazed. Spread yogurt across the bottom of a serving platter or 4 individual plates. 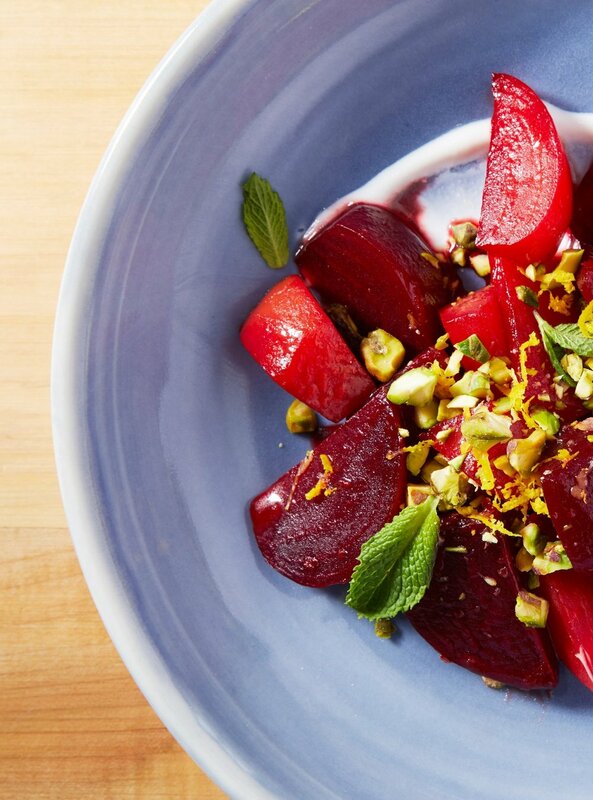 Top with the beets and then with the pistachios. Place flour on a plate, season with paprika, salt, and pepper. Dredge chicken in flour, shaking off excess. Heat oil over medium-high heat. Cook chicken for 3 minutes a side, or until golden. Reduce heat to medium-low and add garlic, honey, vinegar, and fish sauce. 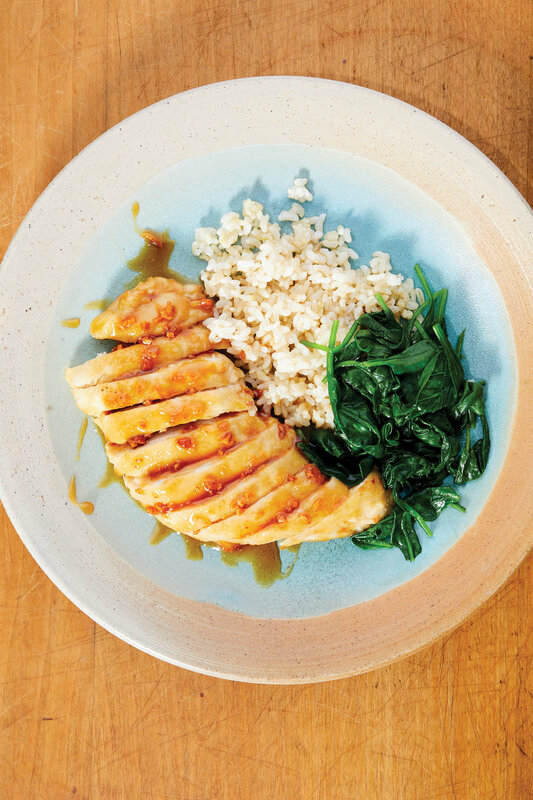 Continue to cook chicken until glazed with sauce and cooked through to 165°. This recipe, adapted from David Lebovitz’s The Perfect Scoop, is a delicious change from good ol’ vanilla. Wildflower honey makes a delicious ice cream, but for a real pop of flavor use a strongly flavored honey like buckwheat or conifer honey. The honey is added at the end of the custard-making. Honey is gently acidic, and adding it too early could cause the base to curdle. In a large bowl whisk yolks and sugar together well, until sugar is dissolved into the yolks. Pour the cream into another large bowl and set a mesh strainer on top of the bowl. In a medium saucepan bring milk and salt to a simmer. Pour warm milk slowly over the yolks, whisking the entire time. Return the mixture to the saucepan and cook over low heat, stirring with a rubber spatula, until mixture is thick and coats the spatula. Pour the contents of the saucepan through the strainer into the cream. Stir gently to combine, then whisk in honey. Chill well overnight and then freeze in an ice cream maker following the manufacturer’s instructions. This vinaigrette is a handy mealtime tool to keep around. Try it on grilled vegetables (as we have here), or marinate grilled shrimp to stuff into a taco. Whisk all ingredients together, adding salt and pepper to taste. 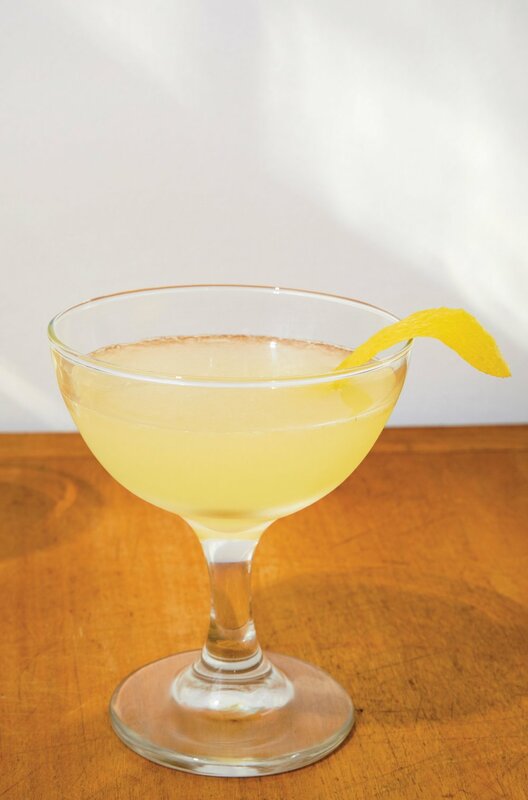 This classic cocktail dates back to Prohibition. The honey and lime juice likely helped to mask the flavor of bathtub gin! Today, make this drink with a smooth modern Plymouth-style gin (these gins highlight more subtle aromatics and leave the juniper in the forest). Try adding a thyme or lavender sprig to the shaker for a different take on the classic. Combine all ingredients in a cocktail shaker. Swirl the shaker to melt the honey into the lemon juice. Top with ice. Shake until chilled. Strain into a coupe glass. For a less complicated seasonal treat I always go back to my wife Angie’s childhood summer lunch of sliced tomatoes on buttered toast. Our house version includes the best-quality rustic country bread we can find and our favorite golden Sicilian extra-virgin olive oil on the heated, crispy toast along with a fresh bright spritz on the thick, ripe tomato slices. With a pinch of sea salt and pepper just before serving, it might not be the best thing since sliced bread, but it could be the best thing to put on it. This may never replace the iconic wing, but these spicy bites are pretty darned addictive. Plus, a hot oven gives you crispy florets while keeping you away from the deep fryer. Use your favorite purchased blue cheese dressing, or whip up your own by whisking sour cream, a splash of red wine vinegar, a generous amount of ground pepper, and a handful of blue cheese crumbles. When cutting up the cauliflower, don’t toss the core—cut it into thin strips and roast it along with the florets. Heat oven to 450°. Spray a rimmed baking sheet with cooking spray. In a large bowl, whisk together flour, water, salt, and pepper. Add cauliflower and toss to coat well. Lay onto baking sheet and roast for 15 to 20 minutes, until crisp. In a large bowl, stir sriracha and butter together. Toss the baked cauliflower in the sauce. Return florets to the baking sheet and bake for another 30 minutes, or until crisp. Serve with blue cheese dressing and carrot and celery sticks if desired. This recipe, taken from the blog of Cathy Barrow, friend of Edible Pioneer Valley (cathybarrow.com), makes the perfect bar snack. Adjust the ingredients to suit your taste: Leave out the nuts, amp up the pepper, swap the bourbon for rum, and so it goes … Cracker Jill lasts about two to three days in a tightly covered container. Heat oven to 250° and line 2 baking sheets with parchment. In a 5-quart heavy pot, heat the grapeseed oil and 3 popcorn kernels. When the kernels pop, add the rest of the popcorn, remove the pot from the heat, cover and wait exactly 30 seconds. Place the pot back on the heat, shaking often until the corn stops popping. Dump into a very large bowl immediately. Add bacon, bacon fat, and peanuts. Set aside. Make the caramel: In a 3-quart saucepan, cook the butter, sugar, and salt until dark amber and a candy thermometer reads 265° to 270°. Add the baking soda and stir well, then add the bourbon and chili powder and stir very thoroughly and carefully, as the bourbon may sputter. Pour the caramel over the popcorn and stir gently and thoroughly to coat with caramel. Spread the popcorn out on the baking sheets lined with parchment. Slide in the oven and bake for 1 hour. Cool completely. Break up especially large chunks. Chickpea flour is used in snacks across the world. In Italy, chickpea flour is mixed into a crispy crèpe called farinata. In India, chickpea flour (called besan flour) is used in pakoras and other fritters. This recipe hews closely to the French panisse, a french fry–like fritter. Chickpea flour is easily found in supermarkets and Indian markets. Spray a 9- by 13-inch baking dish with pan spray. In a medium saucepan, whisk together the flour, cumin, salt, and pepper. Whisk in water until there are no lumps. Place the pan over medium heat. Stir continuously with rubber spatula until the mixture is very thick. Scrape the batter onto the baking dish and spread it into a ½-inch-thick layer. The batter may not cover the entire dish. Cover with plastic wrap and chill overnight. The next day, unmold the batter and cut it into french-fry-sized strips. In a heavy skillet, pour oil to a depth of ¼ inch. Heat oil until very hot, but not smoking. Gently lay the strips into the oil in batches and fry, turning to brown all sides, about 5 minutes total. Do not crowd the pan; the strips should not touch each other. Drain hot fries on paper toweling. Serve with garlic mayonnaise. Mix all ingredients together. Keep cold until ready to serve. Jalapeño poppers are standard bar fare. In this recipe, shishito peppers and a tequila-spiked queso dip offer similar flavors in a slightly more elegant package. No deep-frying required! No peppers on hand? The queso dip is also great with tortilla chips or cut vegetables. Heat a large cast-iron skillet or grill pan over high heat until very hot. (If you have an exhaust fan, this is the time to use it.) Add the oil to the pan, then the peppers. Let the peppers rest in the skillet until charred, then stir gently to spin and char evenly. Let the peppers cook for another minute or two. The peppers should be charred and starting to soften. Remove from skillet and sprinkle with salt. Serve with queso dip. In a medium nonstick skillet over medium heat, heat the olive oil. Add onion, garlic, and a pinch of salt. Cook, stirring occasionally, until onion has softened. Add the tequila to the skillet and cook until it’s almost completely evaporated. Reduce the heat to low. Sprinkle the cheese into the pan. Stir constantly, until completely melted. Stir in the sour cream and cilantro. Keep warm in a small chafing dish until ready to serve. Perfect for game day or any day, these two-bite morsels will tick all the essential snack boxes: crispy, cheesy, and salty. Try fingerlings or tiny new potatoes. If only large ’taters are to be found, follow the recipe (the baking time will be longer), but cut the potatoes into inch-wide wedges. Heat oven to 400°F. Bake potatoes until cooked through, about 30 to 45 minutes. Let cool until cool enough to handle. Cut each potato in half lengthwise. Gently scoop out some of the potato, making a boat. Drizzle each half with olive oil and season with salt and pepper. Bake for an additional 20 minutes, or until the potatoes are golden and crispy. Divide the cheese and bacon between the potato halves. Broil until the cheese melts. Remove from oven and top with sour cream and chives. My 6-year-old daughter will dip anything into what she’s drinking. It’s like a compulsion. Whether it’s cookies in milk or baby carrots in juice, there seems to be something deeply satisfying to her about the act of plunging a morsel of food into her cup and gobbling it up. Searching for a treat that pairs well with her quirky habit recently led me to a new baking project: biscotti. This version features toasted almonds and a hint of orange zest. The flavors are subtle and perfect for soaking up all sorts of drinks—both kid- and parent-approved. You’ll be pleasantly surprised by the texture of the cookies, which are dry and crunchy but not dense and hard like the ones often found in pastry shops and cafés. Making the cookies is a two-step process. After the dough is baked and cooled slightly, it’s sliced and returned to the oven for several minutes more. This allows each cookie to develop its characteristic texture. During the first step, kids can mix, roll, and shape the dough; and in the second phase, they can take charge of arranging the cookies on the baking sheet before the second bake. Heat oven to 350° and line a baking sheet with parchment paper. In a small bowl, whisk together the flour, baking powder, and salt. In a stand mixer fitted with paddle attachment and set at medium speed, cream the butter and sugar until light and fluffy. Add the eggs 1 at a time and blend between each addition. Add the vanilla and almond extract and the orange zest and continue to blend until incorporated. Reduce the mixer’s speed to medium-low. Slowly add the flour and blend well. Add the almonds and mix for just a few seconds to incorporate. With floured hands, scoop up the dough (it will be very sticky) and place it on a lightly floured surface. Evenly halve the dough and roll each portion into a 1½- by 15-inch log. Transfer to the prepared baking sheet and arrange with a few inches between each log. Gently press the top of each to flatten it slightly. Bake until golden and puffy, about 25 to 30 minutes. Transfer to a wire rack and let cool 15 minutes. Reserve the baking sheet. With a sharp knife, slice each log into ¾-inch cookies. Arrange on the baking sheet, standing upright, and return to the oven. Bake until lightly dried, deep golden, and crisp on the outside, about 15 minutes. Transfer to a rack to cool completely before serving. In a 1-gallon sauce pot, place the oil over medium heat. Add the radishes, apple, and ginger and cook for 10 minutes (do not brown). Add the bay leaves, thyme, salt, pepper, and cardamom and cook for 1 minute. Add the stock. Bring up to a boil and simmer for 20 minutes, or until the radishes are very tender. Remove the bay leaves and thyme, add the lemon zest, and carefully purée in a blender until very smooth. Refrigerate. Toss the scallions with 1 tablespoon of the oil, then season them with salt and pepper. Grill over a hot fire for 1–2 minutes per side, until cooked. Toss the radishes with the remaining oil, salt, pepper, and sugar, and grill over medium heat until very tender, 4–5 minutes per side. Remove from the heat and toss with the lemon juice. Cut the cooled scallions on the bias into 1-inch lengths. Toss with the radishes and divide between bowls. 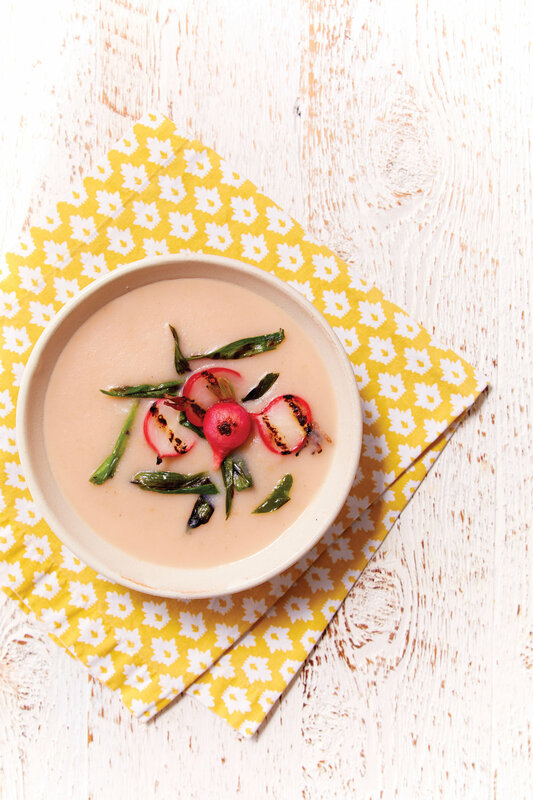 Pour the soup around the radishes and serve. With the holidays on the horizon, my food radar usually goes into celebratory mode. The obvious starting point of a proper celebration is the ubiquitous sparkling wine cork flying across the room followed by a Vesuvius-level flow of effervescence exploding out of the bottle. Whether it’s a $5 Cava or a $300 vintage Champagne, bubbles have come to signify that magic moment. From a family’s Thanksgiving toast to the first kiss of the New Year, everyone is seemingly absolved of past indiscretions, replaced with a clean slate of optimism. All of these good feelings must be lavishly fed and nothing screams “splurge” like caviar and lobster. Caviar is a bit more esoteric, having almost as many detractors as fans. But for across-the-board extravagance, lobster is a sure bet. When I was growing up in Wisconsin in the late 1950s, we were not a lobster-consuming family for good reason—it was to hard find lobster. The only ones I knew of were lounging about in the special aquariums of high-end city restaurants. And even if we found one at a market and could pay the hefty tariff, there was the quandary of how to cook it. So the only real option to have lobster for a celebration was to visit one of the elite restaurants. Since anything on the menu that ended in “MKT PRICE” was not happening for our family, I would live vicariously through the impeccably dressed couple on the other side of the dining room, their eyes slightly rolling back in their heads as they regally bathed shimmering chunks of lobster in a silver cauldron of heated butter. It was an instant imprint. My first solo lobster was at my high school senior prom. I ushered my date from my aunt’s borrowed Oldsmobile Vista Cruiser and we ceremoniously walked through the A-frame door of Giles’ Leilani, the ultimate in ’60s Polynesian-Tiki chic. We started with two virgin Piña Coladas, ceremoniously served in hollowed-out coconuts, holding de rigueur umbrellas that shielded them from any spontaneous tropical downpours. As I peeked around the enormous menu at my date, I already knew what I was having: the go-for-broke MKT lobster—which I just knew would score big points with her. After two months of meticulous planning, it turned out she didn’t eat shellfish! Unprepared but undeterred, I decided, I’m going solo! I started to question my super-cool move when the waiter encased me in a billowing garbage-bag-sized bib. Feeling less than regal by the time the lobster arrived, it only got worse as I tried to dismantle the crustacean, looking like one of the apes flailing around the monolith in Kubrick’s 2001: A Space Odyssey. The final humiliation was when the waiter, without saying a word, took the lobster back to the kitchen to have the shells cracked so I wouldn’t starve. After many years of training and firsthand experience, I now feel at one with the lobster. While summer lobsters, especially soft-shells, are all silky and tender and preferred by many, I personally favor the hard-shell winter lobsters. They have a denser texture that eats with a slight snap like a good, natural-cased hot dog. I join them with littleneck clams, Polish egg noodles, and market-fresh Pioneer Valley Brussels sprouts and an assertively spiced, sherry-kissed white wine tomato clam essence. It’s a decadent, easy-to-eat winter showstopper that is worthy of any celebration. Best of all, no bibs are required. Place a sauce pot over medium-high heat. Add 4 tablespoons of the olive oil and, when oil is hot, add the lobster shells and sauté, stirring, for 5 minutes. Add 2 tablespoons of the shallots and garlic and sauté for 2 minutes, stirring. Add the tomato paste, smoked paprika, fennel, cumin, Aleppo pepper, and bay leaves and sauté, stirring, for 2 minutes. Add the sherry and white wine, bring up to a boil, and cook for 3 minutes. Add the stock, bring up to a simmer, and simmer for 20 minutes until the mixture is reduced by one-third (you’ll need 2½ cups liquid after straining). When the lobster stock is strained and ready, place a sauté pan over medium-high heat. Place the remaining 2 tablespoons of oil in pan, season the lobster pieces lightly with salt and pepper and place in the pan. Sauté the lobster meat about 20 seconds per side, then remove to a plate. Season the sprout leaves very lightly with salt and pepper. Toss with the remaining 1 tablespoon of shallots. Add to the pan and sauté just to slightly wilt, about 30 seconds. Add the vinegar, toss, and remove sprouts to a plate. Add clams to the pan along with 1 cup of the strained lobster stock. Cover, bring up to a simmer and cook until clams open. Remove the clams and divide between 4 bowls. Add the remaining lobster stock, noodles, and lobster meat to the pan. Adjust the seasoning with salt and pepper and just bring back to a simmer. Immediately remove the lobster meat and divide it between the 4 bowls with the clams (½ tail, 1 claw, and some knuckle meat). 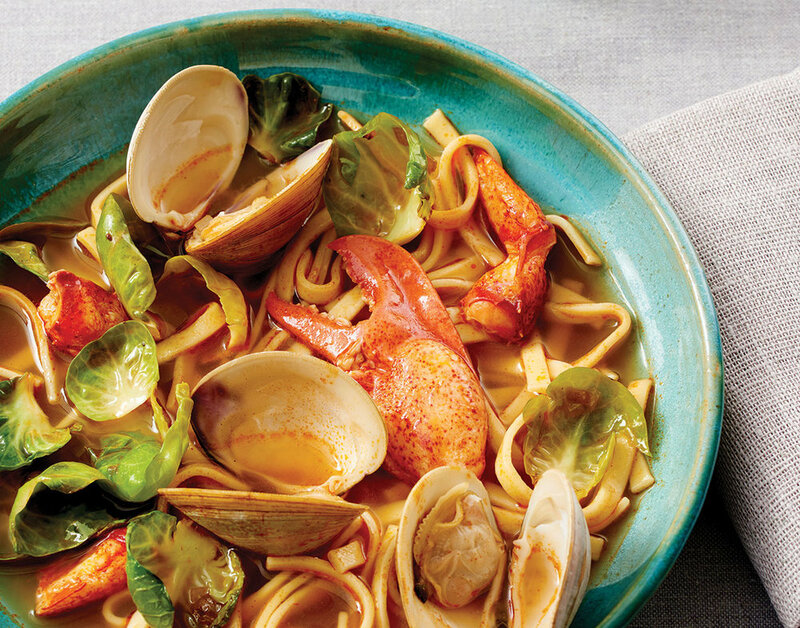 Divide the noodles and broth between the bowls and garnish with Brussels sprout leaves. Serve hot. Serves 4–6 hungry farmers as a main meal. 11:00 Put ½ pound brown lentils in a small pot and cover with 2 inches water. Add 1½ teaspoons salt and 2–3 bay leaves. Bring to a boil, then reduce to simmer. 11:05 Heat a large pot of water for pasta. 11:30 When everything is nice and rosy, add 1 can of San Marzano tomatoes or 1 quart of homemade tomato preserves. By this point, your pasta water should be boiling, so you might as well salt it (2 tablespoons) and get the pasta cooking. I like to use ditalini or other small shapes. Don’t forget to check on the lentils to make sure they are actually cooking and have plenty of water. 11:35 Wash 2 bunches of Tuscan kale or another green. Kale, chard, or spinach work equally well, but not broccoli rabe or mustard greens. Strip out the tough center rib and coarsely chop the kale. Add it to the tomato sauce, but don’t overcook the pasta, which should be done by now. Strain it into a colander when it’s al dente, then return to the pot you cooked it in and drizzle with a little oil (2–3 tablespoons) to keep pasta from sticking. 11:50 By this point, the lentils should be most of the way there. Taste them to make sure. There should be several cups of rich broth left in the lentil pot. Add the lentils and broth to the tomatoes and check for flavor. It should taste salty. If it doesn’t, add salt. 11:55 Heat 1 stick of butter in a small saucepan and add 1 bunch of chopped fresh sage. Cook over medium heat for a few minutes to infuse. It’s OK if it browns a little, but don’t burn it. Meanwhile, set the table, make a pot of coffee, and get the parmesan out of the fridge. If you find any bread in the house, you can put that out, too. 11:59 Add the kale, lentil, and tomato mixture to the pasta in the pasta pot. Pour in the butter, taking care not to add the sage leaves. I find the sage itself to be quite bitter, but the aroma to be intoxicating. The mixture should be fairly brothy but not soupy. Boil the fiddleheads in salted water for 2 minutes, or until they are crisp-tender. Drain and plunge in ice water to stop the cooking. When cool, drain them into a colander. Repeat the process of boiling and cooling with the squash and the ramps. Boil the peas for 2 to 3 minutes, or until they are just tender, and drain. In a heavy skillet, combine 2 tablespoons of the butter, the onions, thyme, and bay leaf, and sauté the mixture for 2 minutes. Add the morels and cook until they are tender. Add the fiddleheads, squash, and ramps and cook for 1 minute (just to reheat the vegetables). Add the peas, parsley, mint, and garlic. Stir in the remaining 2 tablespoons of butter, stirring until the butter is just melted. Discard the bay leaf, season with salt and pepper, and serve. Just about any dark, leafy green works well in this soup—traditionally it’s made with Swiss chard—but I’ve found that collards provide just the right element of savory dimension to make it extra tasty. While the onions slowly cook and the beans are simmering, my girls often prep the greens, squeeze the lemons, and cut the potatoes for the finishing steps. Be sure not to overcook it. The lentils should maintain their shape, though the soup will thicken slightly as it begins to cool. Don’t be surprised if the next day’s bowl is even tastier than the first! Place the lentils, 1 teaspoon salt, and 6 cups water in a large pot. Bring to a boil, then reduce the heat to simmer and cook 15 minutes. Meanwhile, in a large pan over medium heat, warm the olive oil. Add onions, remaining salt, pepper, and coriander. Cook, stirring occasionally, until onions are well-browned and caramelized, about 20 minutes. Add garlic and cook 1 minute, then add the flour, collards, and cilantro, and cook, stirring occasionally, until the greens have wilted, about 2 minutes. Stir the onion mixture into the pot with the lentils. Spoon a bit of broth from the soup into the emptied pan and use it to deglaze the pan, scraping up any brown bits. Add the mixture to the soup. Stir in potatoes and lemon juice and return the soup to a simmer. Continue to cook until the potatoes are tender, about 10 minutes. Read the story behind the soup, Satisfaction by the Bowl. This recipe from Betty Rosbottom’s new book, Soup Nights, is the perfect antidote to cold winter nights. Betty shares a tip direct from Julia Child: “She suggests stirring some small strips of Gruyère into the soup before adding the toasted bread slices. Those little strips melt as the soup simmers in the oven, melding beautifully into the onion broth.” Read more about Betty’s new book on page 10. Serves 6. I am never without a jar of these onions on hand. They go well in everything: chopped into salads, sprinkled onto grilled beef or lamb, stuffed into a wrap with hummus, anywhere you want a tangy hit from vinegar and a little oniony bite. They keep forever in the fridge, but they’re so easy to make, I usually pickle a pint at a time. Makes 1 pint.